Recent loss of life from large landslides in the United States (such as those in Oso, Washington; and Salt Creek, Colorado) has increased the awareness of landslide hazard to public-land managers in the West. About 20 years ago, a large landslide occurred adjacent to Cook Lake in the Bear Lodge Mountains in northeastern Wyoming. Recently, RESPEC (an engineering consulting group) was contracted by the United States Forest Service (USFS) to design an early-warning system to protect recreational users and a downstream community from potential disaster in that part of Wyoming. In 1997, after several years of record rainfall, a large, 27-acre rotational landslide occurred at night in mudstone strata of the Jurassic Sundance and Redwater formations due to soil saturation. A near-vertical, 15-meter head scarp was formed, along with a large muddy toe from the extrusion of fluidized clay that displaced the western shoreline of the 31-acre lake. A 19-unit campground and popular hiking trail were evacuated and closed. The lake’s dam was threatened with failure from overtopping, which could lead to downstream flooding and possible loss of life. The landslide remains active today, with numerous occurrences of audible tree cracks, visible rock fall, tension cracks, and a fluctuating shoreline. In the fall of 2016, RESPEC drilled two deep boreholes to investigate the landslide failure plane. They installed downhole piezometers, TDR cables, and inclinometers, which were integrated with Campbell CR6 dataloggers. Data is transmitted to a base station equipped with a CR300-RF407 (datalogger with radio) and satellite receiver, located approximately one mile away. 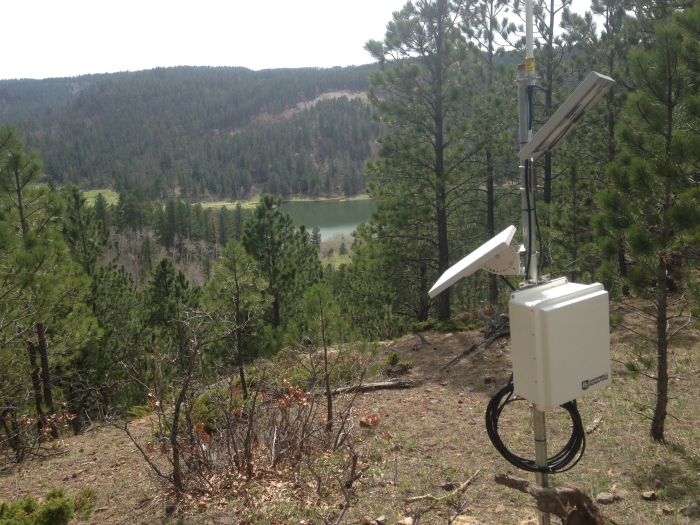 Additional tiltmeters and rain gages were installed along the landslide periphery to detect shallow landslide movement and provide local precipitation data. Single tiltmeters were integrated with CR300-RF407 dataloggers that also transmit to the base station. Data is compiled with the eagle.io web browser, which provides a near-real-time data interface and early-warning alarms to USFS staff.